NBC 6 Reporter Erika Glover is in Southwest Miami-Dade, where all the victims have been recovered from the collapsed bridge. 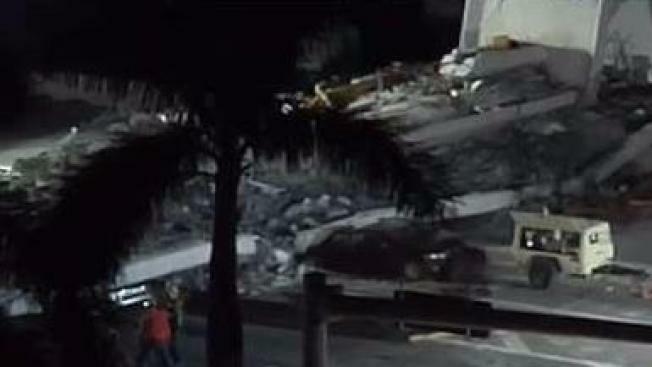 Authorities recovered the final two victims from the bridge collapse near Florida International University on Saturday, after two days of arduous work. "It has been a laborious, tedious process," Miami-Dade's Police Chief Juan Perez said at a press conference Saturday night, describing the efforts required to locate and extract victims beneath 950 tons of concrete. The only time rescuers paused during their days-long search-and-rescue efforts, Perez said, was when officials prayed over victims before escorting them the medical examiner's office. Five people died when the pedestrian bridge came crashing down on March 15. A sixth victim died at a hospital from injuries sustained in the collapse. Perez said that although he was "pretty confident" all victims were now accounted for, offiicals would do a final sweep to be sure. By Saturday night five victims had been identified: Alexa Duran, an 18-year-old FIU student; Alberto Arias and his passenger Oswald Gonzalez; Rolando Fraga-Hernandez and Navarro Brown. NBC News reported that Duran was driving home from a doctor's appointment when the bridge collapsed on top of her car. Her best friend, Richard Humble, was in the passenger seat when it happened. He told the "Today" show that he and Duran had been at a red light when they heard a creak above them, just seconds before the bridge crushed their car. Relatives of Arias, said he had been helping his mother move when the bridge collapsed on his white Chevy truck. His friend and passenger, Gonzalez, also died from the impact. Brown, 37, was working on site at the time of the collapse. Experts from the National Transportation Safety Board and the Occupational Safety and Health Administration joined police in taking over command of the scene Friday from first responders, who had spent hours racing to find survivors in the rubble of the 175-foot span using high-tech listening devices, trained sniffing dogs and search cameras. Ten people were transported to Kendall Regional Medical Center from the site of the collapse near Southwest 8th Street and 109th Avenue. Two were listed in critical condition when they arrived and one person died at the hospital. Officials have not confirmed if the deceased was one of the 10 taken there or if it was someone who was brought in themselves. The bridge was reportedly put to a "stress adjustment" before it collapsed over traffic before 2 p.m. on Thursday. Two workers were on top when it pancaked on top of vehicles waiting at a stoplight. Perez and Miami-Dade County deputy mayor Maurice Kemp would not confirm if that test did take place. And on Tuesday, an engineer of the company that designed the bridge warned the Florida Department of Transportation of cracks to the structure in a voicemail, but said the company was "not concerned" from a "safety perspective." Denney Pate from the FIGG Bridge Group left the voicemail, and FDOT employees did not listen to the voicemail until Friday – the day after the bridge collapsed. Sgt. Jenna Mendez of the Sweetwater Police Department was one of the first responders on the scene. The collapse happened while she was driving to work and she said she only missed becoming a victim herself because she had been running late and was stopped at a red light when the disaster struck. “I really wasn’t believing what I had seen,” she told NBC's "Today" show on Friday. Mendez said that after realizing what had happened she jumped on top of the bridge to help construction workers who were "severely injured." "I was just in that rescue mode," she said. Fire rescue officials had to yell at her not to put her safety at risk by going under the debris. The Florida Highway Patrol is urging students to carpool on Monday as they return to school. Since roads will continue to be closed well into next week, they anticipate heavy delays as students return to school. FHP also recommends students to plan for heavy traffic delays as they head to class. Details about detours and road closures can be found here.